The Steam Users' Forums, also referred to as the Steam Powered User Forums or SPUF, is the official Steam Community message board hosted by Valve that holds the official forum for Portal & Portal 2 among many other official forums for other Steam games. Logging into the forum requires users to register a new account or log in using an already existing account. Steam accounts are not tied to the forum account in any way. 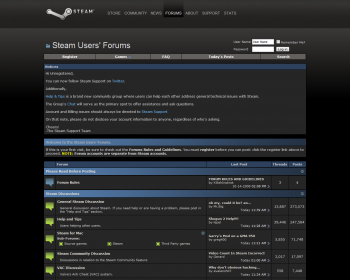 The main forum mainly consists of threads for discussions about the Steam platform and other related issues. In the main forum there are many subforums for the many Steam games sold. It is frequently cited by Valve that they read the posts on the forums, and users are encouraged to post and discuss various aspects of the game. They are interested in the problems that players come across and working towards fixing them; suggestions and solutions to certain mechanics are less helpful, as they do not provide as much focus on the root problem. This page was last modified on 2 November 2015, at 15:45.